Is "Low Beta" Really Low Beta? 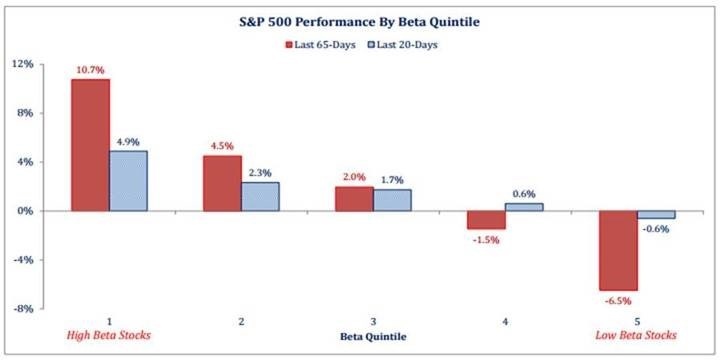 The chart below, from Strategas, highlights the fact that “low beta” stocks have dramatically underperformed “high beta” stocks over the past 65 days. I have talked about this before (Read: The Sleeping Dog has Woken), but the market has become quite comfortable with their allegedly low beta stocks over the last year or two. What they may not realize is that a massive amount of money has chased these stocks, not because they are safe, cheap or have good fundamentals, but because they pay high dividends. Dividends, of course, have become very attractive in such a low interest rate environment. This has potentially made the formerly low beta (remember, beta is a backward looking calculation) stocks into those that carry the most risk if the market begins to believe that interest rates are going higher. This has already happened to some extent. If you look at most staples, REITs, telecom or utilities stocks, which were big winners through July, they are all down measurablyfrom their highs and have been weaker than the general market.